There are very few pieces of home decor that can make such an impact on a room as curtains. Whether a light and airy sheer curtain, or something heavier and patterned, the window treatments you hang in your home have a way of defining your space. But curtains don’t just have to hang in your windows to lend your space style and definition. There are dozens of ways to hang curtains, some you’ve seen, and some that may surprise you. 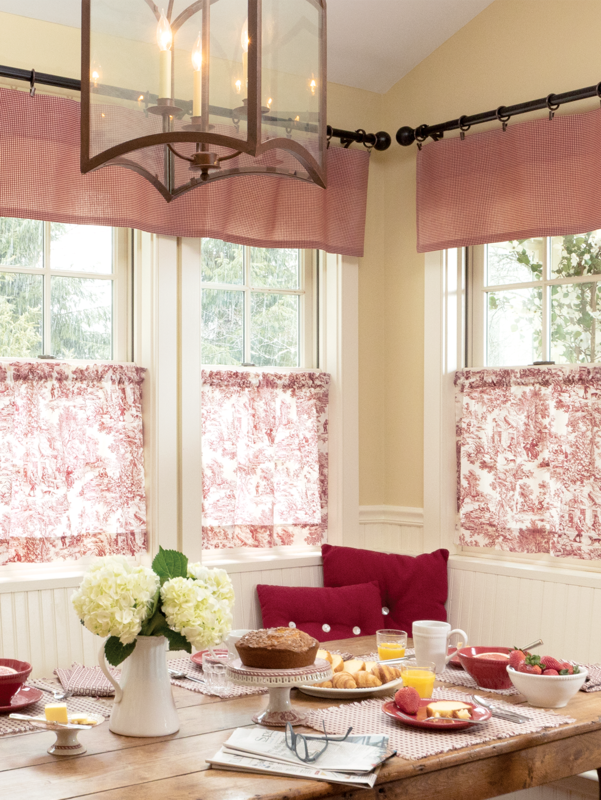 Read on to see our four favorite ways to get creative with curtains. 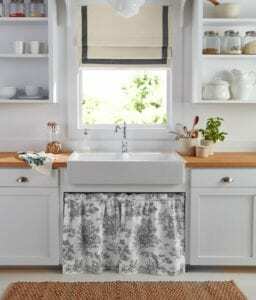 This one may seem a little run-of-the-mill when it comes to creative uses for curtains. These days, you can buy the whole canopy assembly, curtains included. 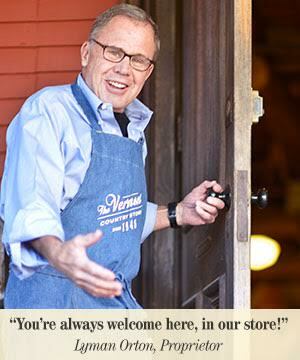 So why did a canopy make our list of top four favorites? Pre-made canopy assemblies are often sold with the same old boring fabrics and leave little room for customization. However, using curtains to make your own, a world of fabric possibilities opens up. Using curtain panels like the ones shown in the picture can add texture and a bit of whimsy to a casual bedroom. Opting for a more sheer curtain can add an airy feel. A patterned or printed curtain can add playfulness or sophistication, depending on the design. Best of all, you can mix and match curtains to create exactly the canopy you want. Possibly one of the cutest on our list of favorites, using a cafe curtain instead of a cabinet door for the space under a sink is utterly adorable. 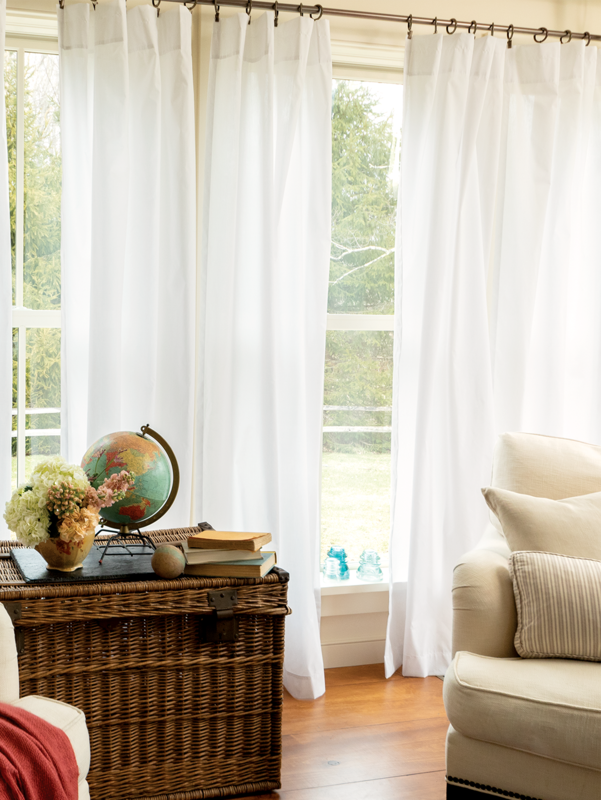 Using a tier style curtain and a simple tension rod, you can add this look to your home in just minutes. Selecting a delicate pattern like the Essex Toile (as shown in the image) can add that little something extra to your kitchen and/or bathroom. We like it because it makes getting to those commonly used items we all store under our sinks easier. And, even if your style preference would never let you hang a busy print from your windows, a small space like this is the perfect place to push your own style boundaries. From florals to solids, and everything between, you have a lot of fabric options to let your creativity fly. There are curtains that are designed just to fit over doors, called door panels. They’re lovely, but typically, once they’re on the door, there’s no opening or closing them, they’re just there all the time. That’s why most often they come in sheer fabrics, to allow the light from the window through. But what happens if you want a little less light or a little more privacy? That’s where our next favorite use for curtains comes in. 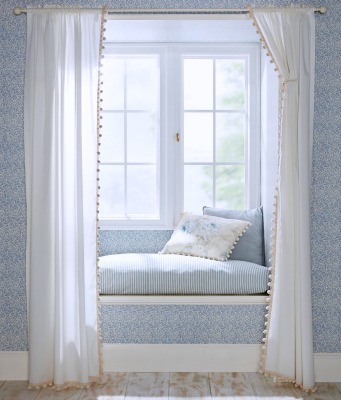 By mounting curtain hardware above the door frame, you can choose any fabric you like. We like the material in the image to the left; light can come through it a little, but it provides more privacy than a truly sheer curtain would. This technique works well over patio or sliding doors. To hang, choose a long curtain panel and a simple swing arm or standard curtain rod. We recommend mounting the hardware at least 2 inches above the door frame to prevent snags if the door is opened while the curtain is closed. Possibly our favorite on this list of favorites is using curtains to create a sweet, serene space perfect for reading or just watching the day. Adding curtains, like these dainty ball-fringed ones, can soften the sometimes harsh edges of a window seat and add an airiness to almost any room. We recommend semi-sheer or sheer curtains to achieve this look. Delicate little details like subtle trim or soft ruffles have a way of creating a cozy space you’ll want to go back to again and again. To hang, choose a curtain rod with decorative ends, and mount it just a few inches above the frame of the window seat. You can choose curtain panels that stop at the bottom of the seat, or that reach down and float just above the floor. Which of these creative curtain ideas was your favorite?